Please check your power bills ! ndia’s largest power producer NTPC Ltd announced a 20% year-on-year jump in its profit after tax (PAT) at R2,498.7 crore in the April-June quarter of the current fiscal. 16,844.9 crore in the quarter from Rs. 15,168.0 crore in the Q1 of 2011-12 financial year. “NTPC generated 58,878 million units of electricity from April to June 2012, an improvement of 7.8% over generation of 54,604 million units in the corresponding quarter of 2011-12,” a company statement said. In the first quarter, NTPC has added 2,160 MW of new capacity, achieving 52% of the target of 4,160 MW for the entire year. The company shelled out Rs. 3,978 crore towards capital expenditure against the target of Rs. 3,967 crore in the three months ended June. “The capex spend in this quarter is 83% higher in comparison to the corresponding period of the previous year. NTPC group incurred capex of Rs. 4,721 crore during Q1 of FY13,” it added. After inspecting the Interceptor Sewer Project of the Delhi Jal Board (DJB) at Kakrola Mode in west Delhi, Chief Minister Sheila Dikshit on Wednesday said major drains are expected to be sewage pollution free within three years, which is a major steps towards cleaning theYamuna. "This project will also provide sewage facilities to many rural villages, unauthorised colonies and JJ clusters," Dikshit said. The project is a major initiative of the DJB to tackle issues of untreated sewage being dumped into the Yamuna. The interceptor sewer is being laid along the three major drains — Najafgarh, supplementary drain and the Shahdara drain — which account for 75 per cent of sewage polluting the Yamuna. Rajkiya Sarvodaya Ball Vidyalay, Geeta Colony : You can contact Mrs Meera Sabharwal & Mr Vijay Kochar..
Vivekanand Mahila College, Vivek Vihar : You can contact Mr Vinod Kumar, RWA Anand Vihar as well Mr Vinod Kumar, RWA Jhilmil in this regard. Sarvodaya Bal Vidyalaya, Karkari road, Vishwas nagar : You can contact Mr Saini, Mr L M Sharma or Mr Dhigan. Centres are also at Mayur Vihar, Trilok puri, Laxmi nagar etc. Plz go there, make a poll & give your most valued suggestions on the machines & system. Delhi Government-run transmission utility Delhi Transco Ltd (DTL) on Monday charged BSES Yamuna Power Ltd (BYPL) with not improving its infrastructure to cope up with rising power demand, saying various areas in the city have been facing outages due to breakdown of the distribution network of the company. The DTL said although it has invested a lot to strengthen the major transmission network in the city, the failure of BYPL to upgrade the distribution system often leads to local faults resulting in long outages. Various areas, where BYPL supply power, have been facing power cuts for upto six to seven hours primarily due to breakdown of the distribution network when the demand goes up. Often the distribution network fails to hold the increasing load and it breaks down. BYPL CEO Ramesh Narayanan, however, refuted the charges saying DTL’s transmission infrastructure in East and Central Delhi was very weak because of which power supply has been affected. ‘The central and east Delhi areas are very vulnerable and DTL will have to improve its network in these areas,’ he said reacting to DTL’s charges. Unhappy with performance of power distribution companies, chief minister Sheila Dikshit last week had directed them to improve their infrastructure and submit weekly report to the government about their operations. DTL public relations officer Rishiraj said transmission capacity in central Delhi is more than double of the distribution capacity. Similarly, he said East Delhi, the transmission capacity in east Delhi is 1,730 MVA as against distribution capacity of 1,477 MVA. with thanks : Millennium Post : LINK : for detailed news. Delhi is on the verge of a big DISASTER. It may be an Earth quake, Fire, Building collapse, Flooding or any other Natural / unnatural calamities. May i request you all, to join us on Facebook, in, "DELHI DISASTER MANAGEMENT NETWORK". Please invite your friends too, to make it, the biggest force, to come out & serve in case of any such incident. Please click this LINK. What happened to 8 wealthiest people in the world? In 1923, eight of the wealthiest people in the world met. Their combined wealth, estimated, exceeded the wealth of the government of the United States.These men knew how to make a living and accumulate wealth. 1. President of the largest steel company, Charles Schwab, died bankrupt. 2. President of the largest gas company, Howard Hubson, went insane. 3. One of the greatest commodity traders, Arthur Cutton, died insolvent. 4. President of the New York Stock Exchange, Richard Whitney, was sent to jail. 5. A member of the President’s Cabinet, Albert Fall, was pardoned from jail. 6. The greatest “bear” on Wall Street, Jessie Livermore, committed suicide. 7. President of the world’s greatest monopoly, Ivar Krueger, committed suicide. 8. President, Bank of International Settlement, Leon Fraser, committed suicide. They forgot to make a life! Just made Money! In a major reform initiative, Delhi's power regulator DERC has decided to introduce a new system under which tariff will be charged according to electricity consumption in peak and off peak hours. The proposed mechanism -- aimed at encouraging consumers to limit their power consumption in peak hours -- will be introduced on a pilot basis, officials in Delhi Regulatory Electricity Commission said. The system, known as Time of Day (TOD) metering, is also expected to discourage commercial users from consuming more power during peak hours and result in minimising load shedding in residential areas when the demand goes up substantially. "An appropriate system of incentives to promote consumption of power in off peak hours and levying of surcharge to discourage peak hour consumption is expected to reduce power purchase cost," the DERC had said while announcing hike in tariff last month. If implemented Delhi will be the first state in the country to have such a metering system, which, experts said, would benefit everybody including the consumers. The power distribution companies often have to procure additional power from the market at very high cost to meet the demand at the peak hours from 6:00 PM to 11:00 PM. with thanks : Business Standard : LINK : for detailed news. Today, we had a meeting with Mr K Dharamrajan, Chairman, Committee of Experts on New DMC Act. The meeting was held at Delhi Sachivalay and almost 35 RWA persons were present there, alongwith representatives of URJA & the team mates of the above said committee. Various Topics ( AS BELOW ) related to RWAs, Bhagidari scheme as well RWC formation were discussed & duly noted by the Chairman. We hope that all the valid suggestions will be incorporated in the new DMC Act. PSV Photography : few pics for you ! NEW DELHI: The recent power tariff revision has raised the price of electricity for Delhiites but discoms continue to complain about the quantum of hike allowed by Delhi Electricity Regulatory Commission (DERC). 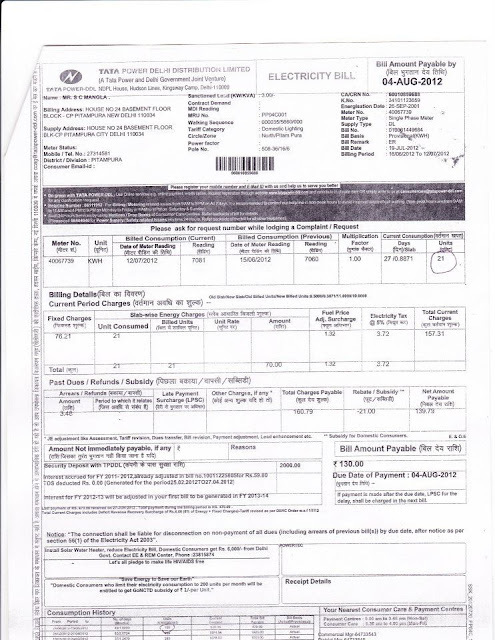 In a letter to the Delhi government last week, Tata Power Delhi said the surcharge of 8% to recover dues was insufficient. It has asked the government to act quickly on its request for capital infusion of Rs 250 crore, claiming the liquidity crisis would continue for a few months despite the tariff hike and surcharge. 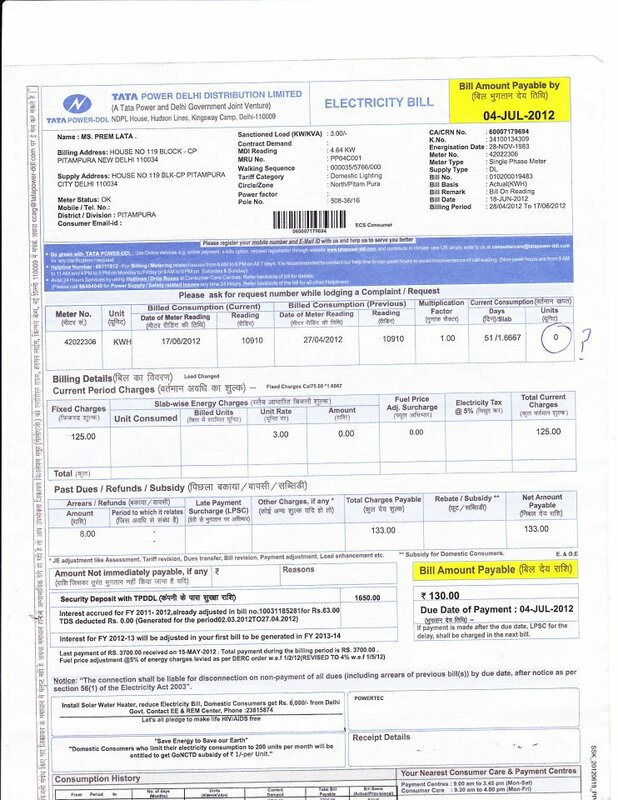 The amount will be matched by parent company Tata Power. "We wish to clarify that the recent tariff revision announced by DERC would certainly make the tariff cost reflective. However, the 8% surcharge allowed by DERC would be barely sufficient to cover the past revenue gap of approximately Rs 4,265 crore as on end-June, 2012. Thus, the liquidation of revenue gap would take a longer period and till that period, we would be required to borrow to repay the principal and accrued interest,'' reads the letter, written by chief financial officer Ajay Kapoor to the government's power department. The power regulator last month announced new electricity tariff across domestic, commercial and industrial categories. While the overall increase in tariffs is a high 20.87%, domestic category consumers have been hit the hardest with a steep tariff increase of approximately 26%. with thanks : Times of India : LINK : for detailed news. Please avail FREE Orthopedic Health Camp & Cancer Talk facilities from doctors of Indraprastha Apollo Hospitals on Sunday, the 15th July 2012 from 10-00 AM TO 01-00 PM. Camp is in Association with Efforts Group & Delhi Senior Citizen Welfare Association at Efforts Group's Recreational Center, Opp B-4/229, Safdarjung Enclave. Please attend the RWAs meeting with Sh Vijay Goel, on 15th July at 10 am at Constitution club, Rafi marg, New Delhi, with a hope, that something constructive will come out on the Power tariff. A meeting is scheduled to be held on 18.07.2012 at 3 pm in Bhagidari Hall of O/0 Dy Commissioner ( East ), Shastri Nagar, regarding MOCK POLL / MOCK ELECTION as directed by Election Commission of India. All the RWAs of DC East office are cordially invited in the meeting. Friends ...... we understand our limitations ....... we do not have the resources or the crowd gathering abilities of political parties. Nor do we have any leaders on whose call most residents will congregate at a given place at a given time like ANNA did. Given the circumstances should we sit back and let the Government and DERC keep fleecing the consumers ......... Armed as we are with the facts that we have in our possession, we have proved it beyond any doubt that Tariffs should be 50% less than what has been proposed. DERC has failed the citizens and there love for DISCOMS is evident from the cunning manner in which they have manipulated the Slab structure of units consumed hitting the MIDDLE CLASS the hardest. No where in the world do we see this much Apathy towards the Domestic consumers. While the Domestic consumer consuming between 200 units to 400 units has been slapped with a 63% hike, kindness has been shown to Commercial and Industrial consumers with under 20% hike. THE LESS SAID ABOUT THE VIPS OF LOOTYENS DELHI ...... THE BETTER. DERC failed to address the issue of Performance Standards, Fast Running Meters, Ending Monopoly, CAG Audit, 24 X7 Power Supply to rid us off Inverters, Realistic Fuel Surcharge-it should not be more than 1% as against DERC's gift of 7% (impossible-they have to give cost escalation not the total cost of fuel), Abolishing Fixed Charge-in DVB days it was minimum charge and more. Do you notice the pattern ..... everything DERC has done is to benefit DISCOMS ....... WONDER WHAT IS THEIR OVERIDING MAJBOORI THAT THEY ONLY SIDE WITH DISCOMS ......... I know for a fact that they do keep an eye for the CM's ISHAARA before hastily announcing Tariff ..... that too without giving any reasons. WE HAVE BEEN CONSTANTLY ASKING FOR SPEAKING ORDERS. Not only that, this Order and indeed the last Tariff Order of 26th August 2011 are Illegal as per Electricity Act 2003 section 182. Let me not get into the details, like I said we have enough ammunition to go to the court and have the Tariffs reversed. Anil Sood and Hemanta Sharma are all for a Proactive approach and so are others I have spoken to. The truth comes out shortage in electric power in Delhi is a manmade affair. Bawana power station is a child of Reliance, Reliance was suppose to buy 1.56 mmscmd gas but unfortunately even 0.83 mmscmd gas is not been supplied. Ideally Bawana plant need 2.4 mmscmd gas to produce 600 mega watt. This explain why we have to buy costly power from outside sources. Who bears the burden? It is the common man like you and me who are suppose to pay through their nose, so is the status of core supply to Delhi plants this means that authorities are in hand and glove the reliance to loot delhiites. when we will understand rise against the corrupt practise. Time and again I have been writing and arguing before Delhi electric regulatory commission that Badarpur Thermal Power Station originally conceived was meant for Delhi, 80% power of Dadri was to reach Delhi, but unfortunately this power is being diverted to other state and Delhi is compelled to buy at higher price, resulting into unwanted power hikes announce from time to time. GURGAON: Over 400 house owners of J block at Mayfield Gardens heaved a sigh of relief after the Resident Welfare Association (RWA) rented a transformer on Sunday late night. For the past few days, the area has been facing severe power cuts and things became unbearable when the transformer stopped functioning due to technical glitches on Saturday night. Things became normal only when the RWA itself decided to hire a transformer the following day. The incident has exposed the callousness of city agencies, HUDA and DHBVN, which failed to provide any help to the residents. "The license of this particular builder has been cancelled and the HUDA has been given administrative control to manage all the housing projects. But they could not do anything when we had to go without power. Ultimately, we had to pool money to rent a transformer," said RWA president, Pradhan Satpal Thakran. 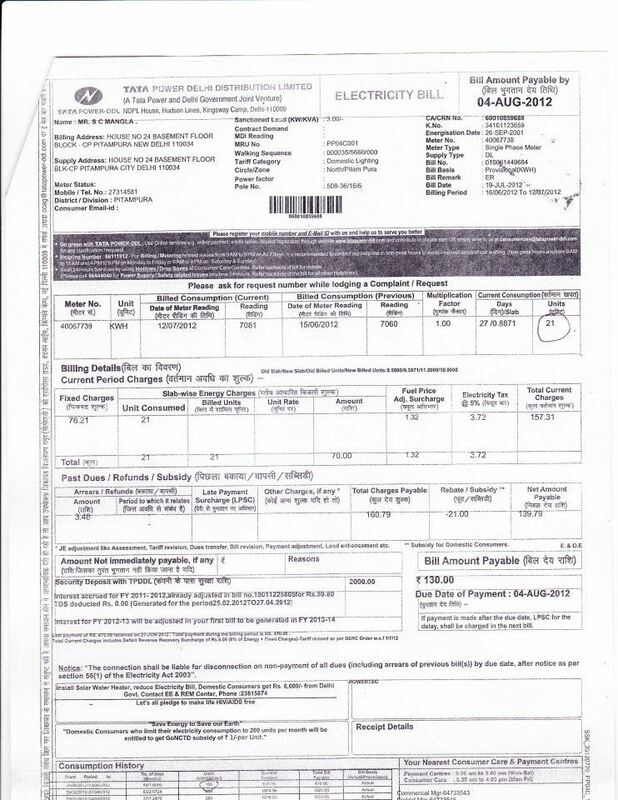 The RWA is paying Rs 60,000 a month for renting one transformer. They also hired a private firm to detect damaged cables and then repair them. The colony has three transformers, and on Saturday night one of the main transformers was damaged. "The RWA has managed to rent one transformer. But now if another transformer malfunctions, we won't know what to do as we won't have enough money to hire another transformer," said Thakran. In February, the Department of Town and Country Planning (DTCP) had cancelled the license of the builder as the promoters of the colony failed to maintain civic amenities like internal roads and community services. "Now, unfortunately there is no clarity as to who will pay for developing power infrastructure in the colonies. The DHBVN doesn't seem interested in the residents' plight," said Commander (rtd) Dharamveer Yadav, president, Sheetal RWA Mayfield Gardens. ग्राम विकास एसोसिएसन व स्वास्थ्य विभाग दिल्ली नगर निगम दुवारा प्राथमिक विद्यालय के बच्चो के साथ मिलकर डेंगू एवं मलेरिया कि रोकथाम के लिए रैली निकालकर गाँव के लोगो को जागरूक किया. रैली का नेत्रत्व श्री नरेश लाम्बा (अध्यक्ष ग्राम विकास एसोसिएसन) व श्री बलजीत सिंह ( सहायक निरीक्षक मलेरिया ) ने किया. रैली में प्राथमिक विद्यालय के 3,4,5 कक्षा के लगभग 100 बच्चो ने भाग लिया . रैली स्वास्थ्य विभाग तथा गाँव के लगबग २० विसिसिठ व्यक्तियों के साथ ग्राम विकास एसोसिएसन के सचिव श्री नरेश सैनी ने बच्चो के साथ मिलकर घर घर में स्वास्थ्य विभाग दुवारा उपलब्ध कराये गए पम्पलेट बाटें और लोगो को आपने छते साफ़ रखने , कूलर का पानी निकालने, टूटे डब्बों को बहार ना फकने के लिए सन्देश दिया. श्री बलजीत सिंह ( सहायक निरीक्षक मलेरिया ) कि टीम दुवारा गाँव के सभी विद्यालयों के बच्चो में डेंगू होम कार्ड वितरित किये गए. The Delhi Electricity Regulatory Commission is set to announce guidelines under which the city's power distribution companies will have to buy a certain percentage of power from renewable energy sources, particularly solar power. New Delhi: The Delhi Electricity Regulatory Commission (DERC), in the coming days, is set to announce guidelines under which the city's power distribution companies, or discoms, will have to buy a certain percentage of power from renewable energy sources, particularly solar power. Gradually, the proportion of power from renewable sources to be purchased by the discoms will be scaled up under the guidelines called the Renewal Energy Purchase Obligation (REPO). At present, it is optional for the companies to purchase renewable power, which is more costly. A unit of power generated through such sources costs roughly twice the price of power produced by traditional methods. DERC chairperson P.D. Sudhakar hoped that once the REPO rules come into force, plants producing power from renewable sources in the city will become viable. To start with, the companies are likely to be asked to purchase 2 to 3 per cent of their overall power requirement from such sources. In Delhi's case, this would mean that the companies will purchase around 100MW of renewable power. with thanks : MSN : LINK : for detailed news. New Delhi, Jul 11 (PTI) The Delhi High Court today asked the Delhi Electricity Regulatory Commission (DERC) to notify the recent tariff hike for electricity consumption in the Capital. A bench of Acting Chief Justice A K Sikri and Justice Anil Kumar asked power regulator DERC to inform it about the power tariff notification within a week after publishing it. DERC has recently announced a 26 percent hike in power tariff for all domestic consumers with effect from July 1. BJP Delhi Pradesh Executive Committee member Ravinder Yadav has filed a petition in the High Court against DERC for on-issuance of a tariff order for 34% tariff hike in respect of electricity consumption w.e.f. 1st July, 2012, for judicial scrutiny. The petition further contends that the hike is against public interest and without justification and transparency. While hearing the petition for admission the High Court has issued notice to DERC returnable within one week. 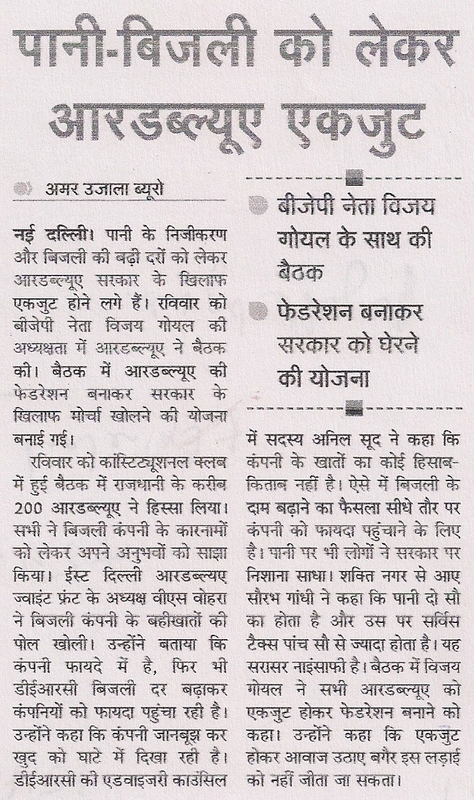 During the last week of June, DERC Chairman P.D. Sudhakar announced the price hike and reiterated that consumers have to pay the high rate w.e.f. 1st July, 2012. BJP Delhi Pradesh President Shri Vijender Gupta also asked Delhi Govt. 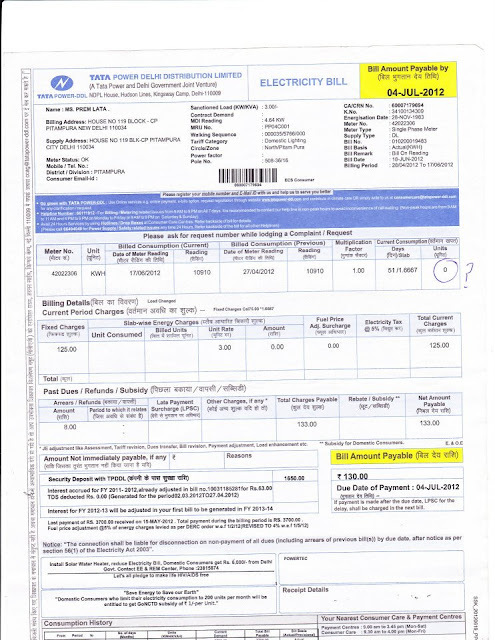 and DERC as to how they put effect of 34% tariff hike from 1st July and on which basis. He also said that all the three companies viz NDPL, BYPL and BRPL are conspirators and are in collusion with DERC and Delhi Govt. and are squeezing blood of the people of Delhi in the name of supply of electricity. In fact they have betrayed with the people in Delhi and have created arbitrarily such situation in yesteryears which is nowhere in any Metro city in India. Gupta has further contended that when Audit Report of all the three companies for the year 2010-11 and 2011-12 have not been finalised, how Chief Minister of Delhi Sheila Dikshit has announced that the companies running in loss.The former DERC Chairman Virender Singh already disclosed last year that all the three companies have earned profit of Rs. 522 crores. This is a contradictory statement of both present and earlier DERC Chairman and truth must come to light with judicial intervention.